Hibiki is Suntory's blended product range, first introduced in the late 1980s. The range includes several award winning age statement blended whiskies - 12, 17, 21 and 30 year old whiskies. All Hibiki whisky is packaged in a bottle with 24 facets, representing the 24 seasons of the traditional Japanese calendar. 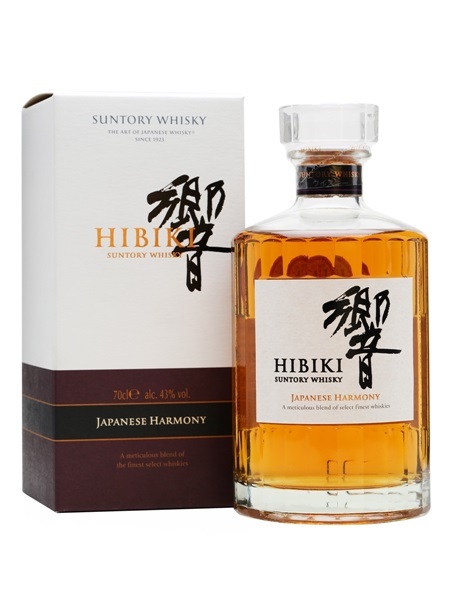 Demand for these whiskies brought about the introduction of the younger, NAS (non-age statement) Hibiki Harmony (~€64). It's a blend of at least 10 different malt and grain whiskies from Yamazaki, Hakushu and the lesser known Chita grain distillery. Five different cask types were used in the maturation process including American Oak, Sherry and Japanese Mizunara. Hibiki Harmony is bottled at 43% ABV.